It was a cold night around 1:00 AM on January 25th, 2018. The 45-year-old undocumented deliveryman Yongshuo Chen felt dizzy and irregular heartbeat on his way delivering a meal around 54th Street and 8th Ave in Brooklyn. After a while, Chen felt his breath became heavier and heavier. He felt so fatigue that he cannot ride his E-bike anymore. He stoped and called his boss, “I feel very uncomfortable.” Chen said. “Sit down and have a rest, I will be there soon.” Chen’s boss said. About 15 minutes later, Chen’s boss and the emergency personnel arrived and found Chen lying down on the ground unconsciously next to his E-bike. 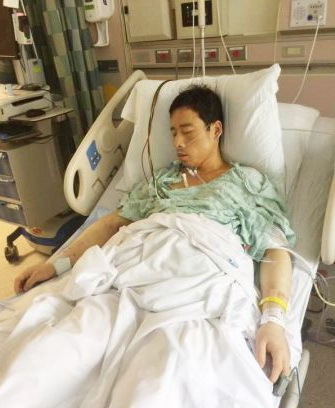 Chen was sent to NYU Lutheran Medical Center immediately, but he never woke up again. Chen’s death was caused by cerebral anoxia, according to Chen’s uncle Fenxin Chen. “He wouldn’t die if he didn’t work so hard,” said Fenxin Chen. On January 25th, Yongshuo Chen had already delivered 60 meals before he started feeling not right. Fenxin Chen thought his nephew died from overwork, but he didn’t realize that Yongshuo Chen’s death might be preventable to some degree——Yongshuo Chen had a long history of hypertension, but partly because he was an undocumented immigrant, he never went to see a doctor or receive regular treatment after he came to New York City since 2016. To control his blood pressure, Yongshuo Chen purchased an unknown Chinese medicine that claims to treat hypertension from a Chinese pharmacy in Chinatown. Yongshuo Chen still owed $50,000 to snakehead before he died. “He worked 12 hours a day and 6 days a week to pay off the debt as soon as possible. When he didn’t feel comfortable, he just take the Chinese medicine and that’s it. Seeing a doctor is never his priority.” Said Fenxin Chen. To help Yongshuo Chen’s family to pay off the debt, BRACE fundraised about $50,000 in Chinese community. According to Shanzhuang Chen, BRACE received at least 10 to 20 cases like Yongshuo Chen per year. In March, 2017 , 35-year-old undocumented immigrant Songqing Gao started feeling there was something wrong with his body. He had poor appetite, belly pain and his eyes turned yellow. Gao chose to bear the pains at first to save money. He was the main income source of his family, and he had a 5-year-old girl and a 2-year-old girls to raise. However, the strong discomforts impacted Gao’s quality of life so seriously that he cannot bear anymore. Finally Gao went to NYU Langone Hospital. Gao was told by the doctor that he had liver failure, which needed to be treated immediately. It also required Gao to receive a whole-liver transplant surgery to save his life. Fortunately, BRACE raised over $20,000 for Gao in 10 days and a liver matched with Gao was also found. The surgery was successful and Gao is slowly recovering from the surgery. However, the undocumented immigrants like Gao and Yongshuo Chen in New York City could have avoided ending up in emergency room or life-threaten condition if they were offered more access to health care. The major barrier for undocumented to get health care access is immigration status. According to New York Immigration Coalition’s report in 2015, there were approximately 500,000 undocumented immigrants in NYC. Of these, 200,000 or more are uninsured and are likely to remain uninsured. Although health insurance coverage has expanded in New York State, the undocumented immigrants has been left behind and their access to quality medical services are limited. For now, only four health insurance options are available for undocumented immigrants under specific circumstances: undocumented children can get insurance through Child Health Plus; Pregnant women can get Medicaid regardless of immigration status, as long as they meet other requirements;Undocumented and not pregnant immigrants can get Medicaid for emergency services, as long as they meet other requirements; New Yorkers with Deferred Action for Childhood Arrivals status can qualify for Medicaid. Undocumented immigrants like Gao or Yongshuo Chen can only get health insurance once they are in an emergency condition. “Without regular access to affordable care, many undocumented immigrants have difficulty getting health insurance to help pay for care. As a result, they don’t regularly access health care services, which sometimes make preventable illness become fatal disease.” Shanzhuang Chen said. Some undocumented immigrants turn to local safety-net health care systems like New York City Health and Hospitals Corporation (HHC) and Federally Qualified Health Centers (FQCH) when they are sick. Both systems serve uninsured patients and don’t ask patients about their immigration status, so they presuming that some of their patients who are low-income but not eligible for Medicaid are undocumented. What’s more, both systems offer low-income uninsured people affordable care on a sliding scale. However, even though HHC and FQCH offer affordable healthcare resources to undocumented, many undocumented immigrants are not aware of these resources or afraid of using these resources. According to Morris Gagliardi, MD, Chief Medical Officer of NYC Health + Hospitals/ Gotham Health, Gouverneur, legal support is also available to undocumented immigrants through ActionNYC at Gouverneur. Immigrants receive free and confidential advice, learn about immigration issues, and get help with completing forms and documents. All uninsured patients are assisted by financial counsellors who work to identify insurance opportunities and help patients apply for Medicaid or other health coverage. If patients are ineligible for health insurance, NYC Health + Hospitals Options is available, providing patients the care they need on a sliding scale, to ensure it is affordable. Gagliardi also mentioned that, within the health system, the main obstacle to accessing health care is the fear that some people may have. He said some undocumented immigrants may be afraid to seek care because of proposed change to a federal rule called “public charge”. The term “public charge” is currently used to describe a person deemed to be primarily dependent on government assistance. “Changes to the federal public charge rule, if they were adopted, could prove to be a far-reaching and highly damaging immigration policy shift, penalizing immigrants for utilizing certain public benefits for which they are eligible—essentially forcing them to choose between proper medical treatment and pursuing a green card or visa renewal.” Gagliardi said. “Policy is only useful when people know about it,” said Max Hadler, Senior Health Policy Manager of New York Immigration Coalition. NYIC has hosted a number of community events or workshops to educate immigrants about health and healthcare. It also host press conferences to let immigrants know that it is safe to go to public hospitals and the patients will be protected from ICE enforcements. “There is still a lot to be done.” Hadler said. Undocumented immigrants is an invisible group, which gives immigration organizations difficulties in reaching out to them. Hadler said it is important to offer more translation services and financial assistance.